Toyota Motor Corporation (TMC) will show the "GRMN (GAZOO Racing1 tuned by MN2) SPORTS HYBRID Concept II", a convertible mid-ship gasoline-electric hybrid concept, at the 39th Nürburgring 24-hour endurance race to be held near Nürburg, Germany, from June 23 through 26. 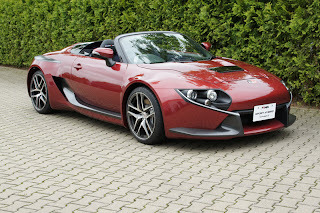 The GRMN SPORTS HYBRID Concept II is an updated version of a gasoline-electric sports concept shown at Tokyo Auto Salon 2010 and has been developed to embody the enjoyment of automobiles. The vehicle features advanced styling and an improved sports-hybrid AWD system with the main power unit (gasoline engine, rear-wheel drive motors and transmission) located in the middle of the body and a front-wheel drive motor in front—all positioned to improve maneuverability, enhance driving enjoyment and provide enhanced stability. Meanwhile, top-down driving in electric-vehicle mode gives a fresh and exhilarating driving experience. TMC launched the world's first mass-produced gasoline-electric vehicle in 1997, and has long conducted active research on applying hybrid technologies to racing and sports cars. The GRMN SPORTS HYBRID Concept II is positioned as the next step in the evolution of these efforts.